Creativity comes from within. Make yours sparkle and shine! I want to start this off with a huge thanks to our wonderful organizer, Linda Anderson! You can check out her blog at From the Bead Board. I am a sponge for learning and am forever taking classes to both refresh my knowledge and add new techniques in order to better my jewelry and other artistic projects. My jewelry talents include beading, pearl knotting, chainmaille, wire-wrapping, Vikings Knit, Kumihimo, silversmithing, coppersmithing, fused glass and enameling. I cut my own cabachons and have faceted my first stone. I have also started upcycling wine and liquor bottles for use as decorative and service items. I have also started learning how to make hand-sculpted art dolls and other mixed media projects. Looking forward to sharing them with you in the future! It's Time To Join The Party! 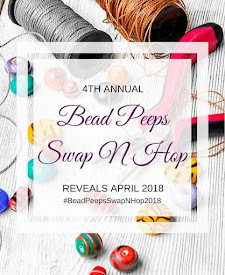 Bead Soup Party Reveal Day! Giraffe Can Has | Almost anything that can be thought of can be homemade! I'VE MOVED!! I'VE MOVED!! I've MOVED!!! !